Perfectly designed for all laptops up to 17.3 inches and helps you get your desktop well-organized. CNC-machined from anodized aluminum alloy and processed with sand-blasting and brushing, with the same texture as Macbook' surface. With sleek design and bevel edges, as well as non-toxic and non-slip silicone mat, this vertical laptop desktop stand protects your laptop from any scratches. Strong Compatibility Holder width ranges from 14mm / 0.55inch to 42mm / 1.65inch, snugly fit most types of laptop and notebook. Dock with double-nut design, this adjustable laptop desk stand can hold your laptop firmly. OMOTON - Better than You Expect ! 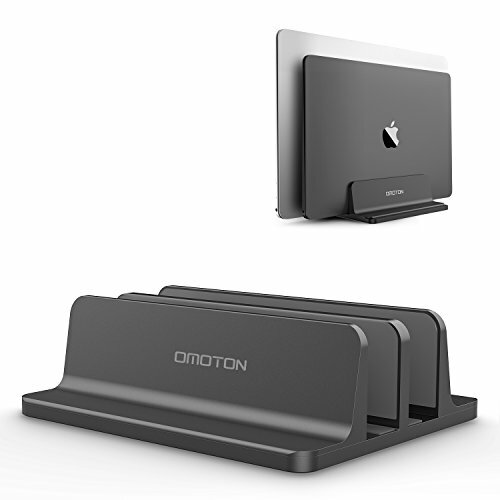 Updated Dock Version: Double dock stand suitable for two laptops like MacBook, Samsung, Microsoft Surface and more. Adjustable Size: Adjustable width compatible with various laptops or the thickness of notebooks varying from 0.55in / 14mm to 1.65in / 42mm. Protective Mat: Non-toxic and Non-slip silicone mat covered around groove, avoid from risking of any scratches to your devices and stable position. Durable and Stable: Anodized aluminum is scratch-resistant and durable and wide base keep your laptop from falling down. Exquisite Design: CNC-machined from anodized aluminum alloy, with sand blasted and brushed processes, the same texture as Macbook's surface. If you have any questions about this product by OMOTON, contact us by completing and submitting the form below. If you are looking for a specif part number, please include it with your message.